This new development comes just in three months after the inauguration of the Alsons Public Safety Complex, an integrated public safety and rescue facility with fire, police and 911 stations, also located just outside Northtown. 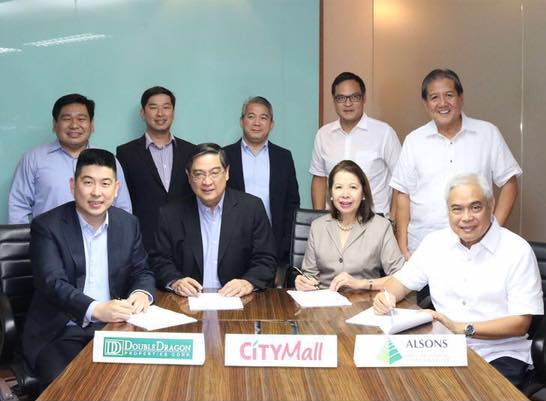 “CityMall – Northtown Davao is expected to be completed by 2017, We can clearly see the vision behind Northtown to soon to become one of the most vibrant areas in Davao City.”,said Edgar Injap Sia II, Chairman of DoubleDragon/CityMall. “We believe that CityMall will be a great addition to the development of Northtown.” Injap added. In photo are the officers of Alsons Group and DoubleDragon Group together with Mr. Edgar Injap Sia II, Mr. Ferdinand Sia, Mr. Nick Alcantara, Mr. Paul Dominguez and Mrs. Rosie Dominguez.